The puzzling architecture of the Solar system has long been a headache for planetary dynamicists. We can sort of divide its structure (Fig. 1, not to scale) into several zones. First, the terrestrial planets Mercury, Venus, Earth and Mars, which are divided from the gas and ice giant planets by the asteroid belt. Beyond the ice giants there is the Kuiper belt, which spans out to very large distances from the Sun. One longstanding conundrum in this ordering is the relatively small mass of Mars and existence of the asteroid belt in between Mars and Jupiter. It shouldn’t be there, and Mars should be way bigger. In fact, Mars is only 10% of the mass of Earth and therefore seems to have never accreted enough material to become a fully fledged planet. In planet formation, Mars-sized objects are usually termed “planetary embryos”, as we think this is the intermediate stage of a planet’s growth. 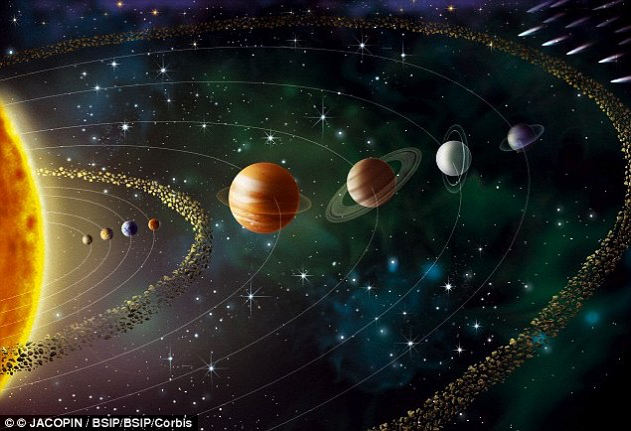 Figure 1: Artist rendition of the Solar System’s architecture, with (from left to right) Mercury, Venus, Earth, Mars, asteroid belt, Jupiter, Saturn, Uranus, Neptune and Kuiper belt. Sailing adolescent Jupiter to blame? To explain the apparent dip in the mass-distance relation of the Solar system (increasing mass with planetary distance from the Sun until Jupiter, and then decreasing again), planetary scientists developed a model deeply rooted in dynamical principles: the “Grand Tack”. The idea of the model is that Jupiter, directly after its formation out of the early Solar nebula at ~3.5 AU (AU = distance Sun-Earth), migrated toward the Sun, became “tacked” on at ~1.5 AU and then migrated outward again to its current positon at 5.2 AU. By doing so it depleted the mass concentrated at the locations of nowadays Mars and the asteroid belt, and thus Mars was never able to grow bigger. It also successfully explains some other issues, such as the inclinations and excitations of asteroids and the transition from water-poor to water-rich asteroids in the middle of the belt. Alternatively, the mass-depletion at Mars’ location could have very early roots, even before (or while) the formation of Jupiter, caused by microphysics in the disk, as was explained in this Astrobite about the pile-up and evolution of dust. Here, the initial small dust grains in the disks did not accumulate everywhere in the disk and start to form planets. Instead, they end up only in specific regions and thus planet formation is concentrated in some narrow zones. In our case, this could be in two locations: one in the inner region, where the terrestrial planets reside nowadays, and one in the outer region, possibly around the region of Jupiter (more details given in this recent review paper). Such a scenario however poses another problem. 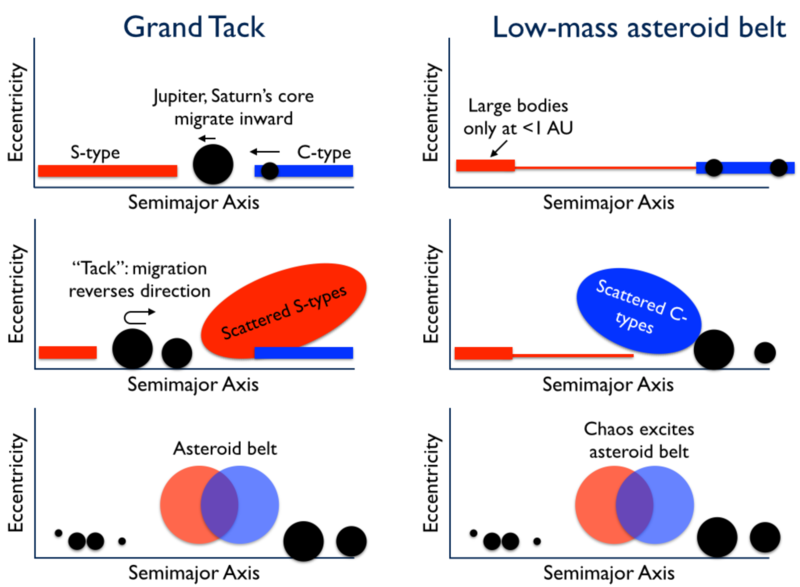 The Grand Tack scenario from above easily explains the current relatively high inclinations and excitations of the asteroids in the belt: Jupiter drops by and gives everyone a huge gravitational swing by the enormous mass it carries. In the other scenario this isn’t the case and therefore we think the asteroids would remain in relatively calm and low-excited orbits. Would it? The workers around Andé Izidoro think differently. They propose that instead of a migrating Jupiter (like the Grand Tack) Jupiter and Saturn were on chaotic but stable orbits. 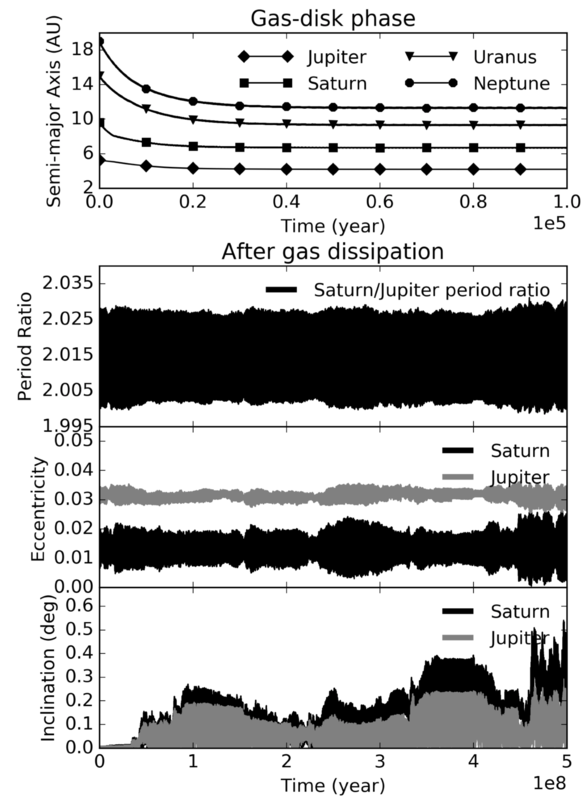 This is illustrated in Figure 2 and shows how the gas and ice giants evolved over time in such a configuration. Essentially what happens is that all the planets roughly formed at approximately where they are today. However, as the early Solar system was subject to dynamic evolution (we have possibly lost some planetary embryos early on), the orbits of Jupiter and Saturn moved continously and chaotically through the disk (though, not nearly as dramatic as in the Grand Tack scenario). Thus, Jupiter came close to the asteroid belt again and its gravity excited the asteroids. You’ll probably ask yourself now where the great difference lies. This is highlighted in Figure 3, where the deviations between the Grand Tack and the “chaotic motion” picture become readily apparent. Instead of one we have now two models, both of which can give us an answer on why the Solar System’s architecture looks like it does today. And fortunately they make some different predictions about how the dynamics evolved in the disks. In the next coming years we may thus be able to distinguish between the two models by testing their differences and may be able to get deeper insights into how our home in the Universe evolved into how it looks today. Chondrule formation by shocks? Chondrules are old and everywhere – are solar system’s solid bodies built by them? An Overview of the Extreme Solar Systems III Conference Are Extrasolar Worlds More Likely to Be Water-rich? Thanks for the heads-up, Greg! I have updated the bite with the correct links. How can I obtain a copy of the beautiful Artist rendition of the Solar System’s architecture, with (from left to right) Mercury, Venus, Earth, Mars, asteroid belt, Jupiter, Saturn, Uranus, Neptune and Kuiper belt? Hi Reginald, I suggest googling “solar system” with the copyright names in the lower part of the image. However, please be aware of potential copyright constraints for the usage.